The head of a village is known as the Sarpanch. SAR means head and PANCH means five, which gives the meaning of – the master of five controlling heads of gram Panchayat of the village. 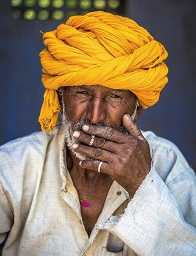 He is also known as Mukhiya and Pradhan (Head) of the village. He is selected among the members of gram panchayat (village constitutional body of people). A deputy sarpanch is also elected for the term of five years. In most places, the president of Panchayat i.e. sarpanch is directly elected by people of the village. He is the bridge between the village population and government officers. All the meetings of the gram Panchayat are held in the presence of the Sarpanch. He is also responsible for its working. He also carries out the schemes that are beneficial for the development of village. The deputy Sarpanch helps the Sarpanch in his work. The woman can also be elected as a Sarpanch and she is called SARPANCHINI. The responsibilities of Sarpanch are- arranging the meetings of gram Panchayats and gram Sabhas, maintaining friendly relationships in the village, arranging higher studies and jobs for the youth, providing free of cost education to poorer sections and giving lots of benefits to girl child, providing health facilities, looking after cleanliness, sanitation and clean drinking water. His other responsibilities also include- motivating villagers to plant more trees, maintaining parks, grounds, and public places, advising villagers about all the governmental schemes, maintaining details of births, deaths and marriages, maintaining celebrations and functions, handling and settling disputes in the village.